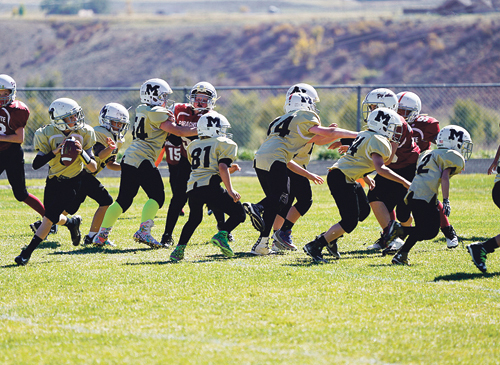 The Meeker Mustangs fifth/sixth grade team hosted Parachute on Saturday at Starbucks Stadium. The Mustangs were down 12-0 at half time but battled hard to be up six points, 18-12, with only a few minutes remaining. Parachute returned the kick off to tie the game and send it into overtime. Meeker had first possession and scored on fourth down. Parachute had next possession and threw an interception on second down, but a holding call on the Mustangs gave Parachute the field position they needed to tie the game. The referee decided to call the game at that point. The Meeker offense led by Ryan Sullivan fought hard on the ground and in the air. Next game is at Coal Ridge, Saturday, Oct. 14 at 2 p.m.